Basson testifies before Zondo Commission - SABC News - Breaking news, special reports, world, business, sport coverage of all South African current events. Africa's news leader. 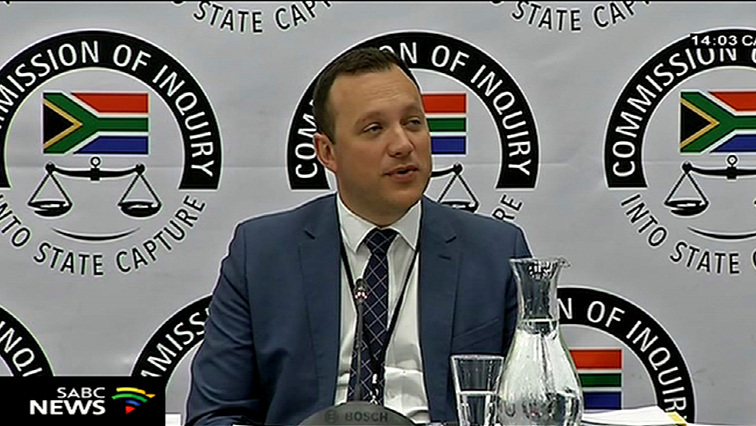 News24 Editor-in-Chief Adriaan Basson testified before the Commission of Inquiry into State Capture on Tuesday. News24 Editor-in-Chief Adriaan Basson has revealed to the Commission of Inquiry into State Capture how he was threatened with death and intimidated. Basson was at the time conducting investigations into the corruption at the Department of Correctional Services as well as Bosasa. He says Bosasa used its employees to intimidate him. Basson took to the witness stand at the Commission of Inquiry into State Capture. Basson had been investigating corruption at Bosasa back in 2009. He told the Commission that he received numerous threatening phone calls. In his testimony, the News24 Editor-in-Chief detailed the threats he received as an effort to try and stop him from further exposing Bosasa and the Department of Correctional Services. Basson says he also received a call from late journalist, Benedicta Dube, who threatened him while he was on holiday. He told Deputy Chief Justice Raymond Zondo that he was surprised by the fact that Dube knew his personal details. The inquiry also heard testimony from former Equal Trade 4 employee, Gregory Lawrence. Lawrence told the Commission how he was responsible for delivering money to Bosasa. This was to allow Bosasa to have cash flow for its bribes. Lawrence also revealed to the Commission how he delivered money bags on occasion to Bosasa of up to R1 million. He told the Commission about how he had reservations about Bosasa, and the cash transactions. The inquiry concluded Tuesday’s proceedings by hearing from its own investigators. Frank Dutton was first on the stand. He confirmed to the commission that a carpet seen in pictures taken by former Bosasa Chief Operations Officer Angelo Agrizzi matched with those of his own probe at the Sheraton Hotel. Dutton further confirmed to the Commission that the hotel’s records show that Myeni was a guest at the time, as contained in Agrizzi’s testimony. Another investigator then gave his evidence. Patrick Mlambo corroborated the testimony of former Bosasa employee Richard le Roux, and confirmed that security upgrades were conducted on the properties of various high profile government officials. He accompanied Le Roux to inspect security upgrades at a number of houses. Le Roux worked for a subsidiary company, GTS, which was also previously known as Sondolo IT, a company which belonged to Bosasa. Mlambo has confirmed to the Commission Le Roux took him to view four homes belonging to government officials who benefited from the Special Projects. Due to the upcoming State of the Nation Address, the commission will resume next Monday. This entry was posted on 05 Feb 2019,09:34PM at 9:34 PM and is filed under South Africa, News, Homepage Latest Stories Slider. You can follow any responses to this entry through the RSS 2.0 feed. Both comments and pings are currently closed.